Here is an interesting article by Jon Leyne about hair in Iran. Usually when people write about hair in Middle Eastern countries, it is women's hair with which they are concerned – in particular with whether it is being hidden by the hijab or a more extreme type of veil. In this case, though, the primary focus is on men's hair. 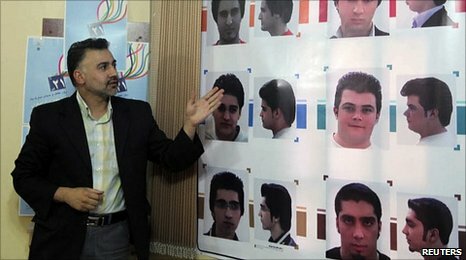 The article reports that outlandish male hairstyles have become very common in the Islamic Republic, and elements within the regime have decided that enough is enough – a list of appropriate male hairstyles have been published and the direst sanctions threatened against those men who keep their hair in styles deemed un-Islamic. Disappointingly, the article does not link off to gallery of Iranian men and their extravagant hairstyles. It also heads back to the more usual obsession of western journalists with the hijab and women's hair. 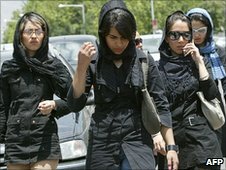 Readers will be astonished to discover that many women in Iran dress as fashionably as they can, given the restrictions the regime enforces. A photo of some Iranian ladies with the most token veils reinforces the point. One thing I wonder with the article is whether it can be assumed that having an outlandish hairstyle in Iran is really a token of resistance to the regime. Leyne mentions that there is a particular look associated with the regime and its paramilitary supporters, but I think it a bit of a leap to assume that every flamboyantly coiffed individual is using his hair to stick it to the man. People style their hair for any number of reasons, and extravagant male hair is not uncommon across the Middle East. Likewise, while unusual hairstyles might be a sign of youth rebellion, that could be the kind of unfocussed apolitical "rebellion" the youth in the West are famous for.